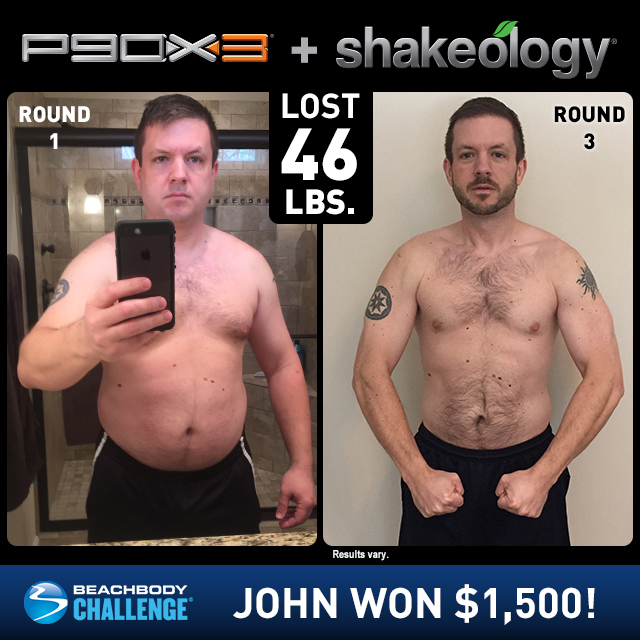 P90X3 Results: John Lost 46 Pounds and Won $1,500! John Dilling, age 41, lost 46 lbs. with three rounds of P90X3 and Shakeology. He entered his results into The Beachbody Challenge, and won $1,500! When I graduated from college, I weighed 150 pounds without ever needing to exercise. I am a CPA and gained 30 pounds in six months after taking my first desk job. I gained another 10 pounds after my son was born and another 10 after my daughter was born. I then hovered around the 200-210 mark for the next 15 years. About seven years ago, I completed the P90X program but never got serious about my food choices so the weight never really came off. I wore baggy clothes to hide the extra weight. I was taking medicine to control my high cholesterol. I continued to eat junk food because it tasted good, but was embarrassed by my weight, and I knew my family was also. About 1 1/2 years ago, my teenage daughter went through a period of deep depression after a cross-country move for my job. That depression worsened and eventually developed into anorexia. She was restricting her food intake and dropped to a very unhealthy weight. We checked her into a program that helped her deal with the emotional and physical issues, and she has made great progress in her recovery. As she was completing the program, I wanted provide her with a good example of how to eat healthy and proper amounts of foods, lose weigh properly, and maintain a healthy lifestyle, both physically and emotionally. My success has helped her see what a healthy body can look like. One of the biggest challenges was finding time to complete the workouts. With a full time job, wife, and teenage kids, it can be difficult to come home to workout instead of just dropping on the couch and having a beer. When I first saw the P90X3 workout advertised on TV, I got excited because I saw an opportunity to complete a workout program but not have it take up my entire evening after work. The other challenge I faced was getting focused and committing to healthy eating. That was my biggest downfall when I completed the P90X program several years ago and didn’t get the results I wanted. This time around, I really focused on how much and what I was putting in my body. Shakeology was a big part of my diet transformation. I knew the nutritional value would benefit my overall diet, so I had a shake for breakfast in the morning that helped set the pace and tone of my daily diet. I loved the fact that it was only 30 minutes! I had previously completed the P90X program and sometimes it seemed to drag along during the workouts, but X3 just moves at a great pace and got my heart rate up in a short amount of time. I also appreciated the opportunity to try new/different types of workouts, like PilatesX. It’s not just about cardio. It’s not just about lifting weights. It’s about getting your whole body in shape through a variety of exercises. Over the course of nine months and three rounds of P90X3, I’ve lost almost 50 pounds representing about 25% of my body weight. All of my vital signs are in the normal range – BMI, resting heart rate, blood pressure.† I am off my cholesterol medicine!o I look great, feel great, and my wife and kids are proud of my transformation. I dropped from tight-fitting size 36 pants down to a loose-fitting size 32 (I could probably now go down to a size 30!). I now wear size M shirts and shorts where I used to wear XL. I gave seven full bags of my fat clothes to Goodwill. I love the responses I get from co-workers and family members that I haven’t seen in a while. I just feel better, I look better, and I’m more confident. I really enjoy exercising now and get bummed out if I have to miss a day. oConsult your physician before discontinuing or altering any prescribed medication.